Finally, I can commit felonies from the comfort of my mobile device. Grand Theft Auto: Chinatown Wars provides the player with the freedom to rob, kill, illegally race, and of course, steal cars in a gritty urban criminal soap opera. Developed by Rockstar Games, Chinatown Wars is the first title in the infamous series to grace the iPhone and iPod touch. Despite its cartoonish graphics and new platform, Chinatown Wars retains the open-world “sandbox” formula and impressive depth of the previous entries in the GTA series. 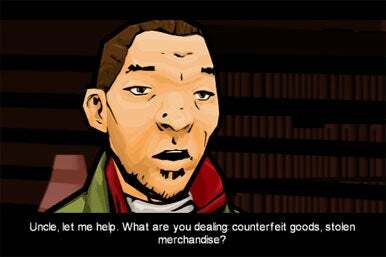 Look and Feel: The dialogue in the cutscenes of Grand Theft Auto: Chinatown Wars won’t win any awards, but the animation has that distinctive GTA look. The story centers on Huang Lee, a spoiled son of a Triad crime lord, who arrives in Liberty City only to be nearly killed upon his arrival due to an ambush by mobsters. In the process, he loses an important artifact that his uncle Kenny wants him to find to reclaim the family’s honor in the eyes of the Triads. Like all GTA games, you’ll have to take jobs that will require you to commit all sorts of crimes—murder, theft, bribery, drug dealing, and so forth. The cutscenes are done in an animated single cell format that is true to GTA’s unique art style. There’s plenty of dialogue in each mission briefing (which you can skip), and I found it particularly hammy and forced. Without voice actors, it’s hard to understand the tone of the conversation. There are plot twists every few missions and a parade of different characters you shouldn’t get attached to. You get introduced to a character in one mission, find out a twist about them the next, then watch them die in the third. Life is cheap in Liberty City. Originally released for the Nintendo DS and later the PSP, the iPhone version retains the DS’s touchscreen capabilities. To maneuver Huang Lee, the game’s anti-hero, a small joystick will appear in the corner while situation appropriate buttons appear on the right. Huang will be able to get into cars, punch, kick, roll/jump, and shoot when necessary. The controls are surprisingly intuitive, and while the top-down view (harkening back to the earlier days of the GTA series) took some time to get used to, it proved especially useful for car chases. There are also various minigames that take advantage of the iPhone’s touchscreen such as hot-wiring a car, drug dealing, and dumpster diving. 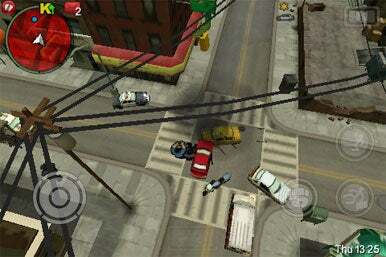 The View From Above: The top-down view in the iPhone version of Grand Theft Auto takes some getting used to, though it’s effective for car chases. As with any GTA game, the major problem with the game’s controls is that they’re not great for combat. Punching and kicking works fine, but getting used to the autolocking functionality means you’ll sometimes end up shooting or kicking in the opposite direction of your foe. Chinatown Wars isn’t a casual game, but it can offer short playing sessions. Most of the missions only take a few minutes to complete, but you’ll have to save your game either in a safehouse or using your PDA—if you get a phone call or have to leave the game for any reason, your game picks up where you last saved. This can be extremely frustrating if you’re merely seconds away from finishing a hard mission when you’re forced to exit the game. Despite the dialogue, controls, and save issues, this is still a titan of a game. The iPhone rarely has games as well designed or as long as Chinatown Wars. You’ll spend hours completing the single-player storyline even without exploring the city to its fullest. There are minigames and side distractions that help flesh out the experience, and these help push the replay value into the stratosphere. Chinatown Wars is also brutally hard, both likely to frustrate casual gamers and keep experienced players coming back for more. Rockstar Games doesn’t do anything half-way, and the violent, gritty, and epic Chinatown Wars is no exception. It’s a big, ugly, raw title. It’s huge in scale and depth—something iPhone players aren’t used to. If many games play like thin leaflets, consider Chinatown Wars your copy of War and Peace. Minus the Peace.